When you fire a shot, you simply cannot afford to miss or you may have a wounded deer running around. Both of which can cost you money and time. Let’s take a look at where to shoot a deer in relation to various portions of its body and different angles. 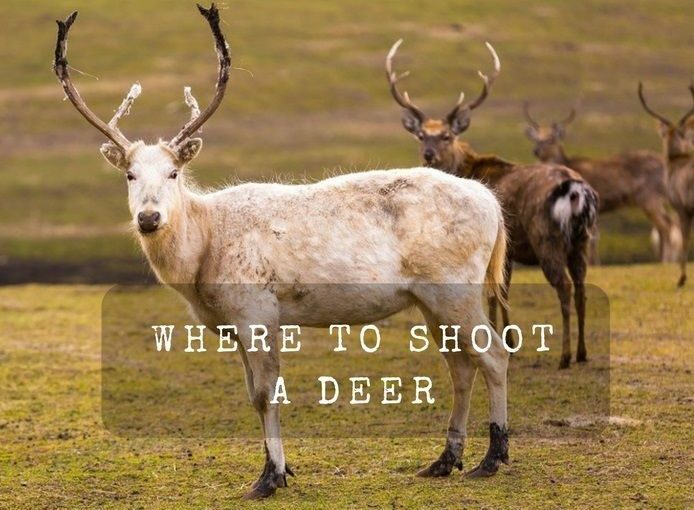 Where To Shoot A Deer On It’s Body? In this section we’ll list the top 4 areas where you should aim for as well as the reasons why. A large, fast moving bullet will break the spine as well as to break its ribs, short-circuit the nervous system and anchor the deer. The cons that are associated with aiming for the high shoulder though, is the fact that it can cause a lot of damage to meat which is located from the shoulder to the neck and backstrap. This shot will lead to massive hemorrhage. As such, it’s blood trail will be easy to track. However, if you only manage to clip a portion of it’s lung, the deer may have the opportunity to recover and since they don’t necessarily lie down after a lung shot, you may have to follow their blood trail. A properly placed bullet has the ability to instantly kill the deer by causing massive shock to their vertebrae and spinal cord, while damaging very little meat at the same time. However, similarly to aiming at their brain, this vital area is quite small. One deer expert proclaimed that if given the opportunity, you should aim for the brain. Ideally, you should draw a line from the left tear duct to the right tear duct, and subsequently aim approximately 2.5 – 2.75 inches above that line. This is described as being the best place to put your bullet if the opportunity presents itself. By firing a bullet into the brain, it will instantly incapacitate the animal and death will follow just a few seconds thereafter. However, the opportunity to aim directly at the deer’s forehead may not always present itself. In this section where going to discuss some tips to consider when it comes to shooting a deer from various angles. The broadside angle is defined as being the best shot angle. This is where you are aiming at the deer from either of its sides. At this angle, the vital area is clearly exposed. It’s also worth noting that a broadside shot also offers the shortest distance of which the bullet will travel through the chest cavity. When it comes to aiming at this angle, aim straight up from the back portion of the front leg, midway between the bottom portion of the chest and back. The quartering toward angle is defined as being okay for the hunter. When it comes to aiming at a deer in this position you should aim at the neck, head or center of the chest in order for you to get an effective hit. However, you should be weary of where your bullet may end up. 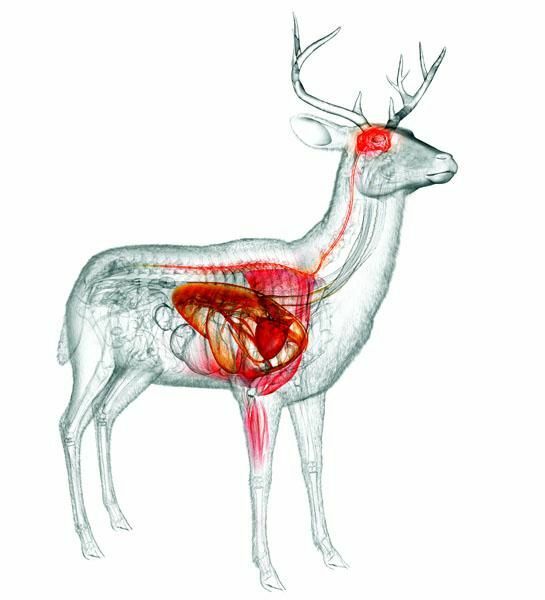 If you shoot a deer behind or in the near front shoulder, your bullet will more than likely go through the intestine and stomach (gut shot) and subsequently go through the hind quarters. Many hunters proclaim that you should avoid making a “gut shot”, because the contents of their intestines and stomach will essentially ruin the taste of the meat. When it comes to the quartering away angle, this is defined as being an okay angle for a hunter. Ideally, you should aim behind the front shoulder in order for you to make an effective hit. Your bullet will go through the lungs and possibly the heart. The rear end shot angle is defined as being the poorest shooting angle for a hunter. By making a shot at this angle, it will basically ruin the best parts of the meat and subsequently lead to a gut shot. However, it is worth noting that you can make a neck or head shot if the deer raises its head up. But in general, when faced with this angle, many hunters proclaim that you should wait for a better shot. When it comes to shooting from a tree or an elevated stand, you need to factor in bullet trajectory. Ideally, you should aim higher on the deer, in order for you to compensate for the downward spiral motion trajectory of the bullet. Most hunters recommend that you should visualize how your bullet will enter the top portions of the deer and exit the bottom, to determine if you have a good shot. Here is a video, which gives a visual demonstration of where you should shoot the deer when aiming at it, from various angles. You can use it, to gain some insight as to why it’s important that you aim at various sections on the deer, depending on the angle of it.